the making and re-making of love – Love. Life. Practice. 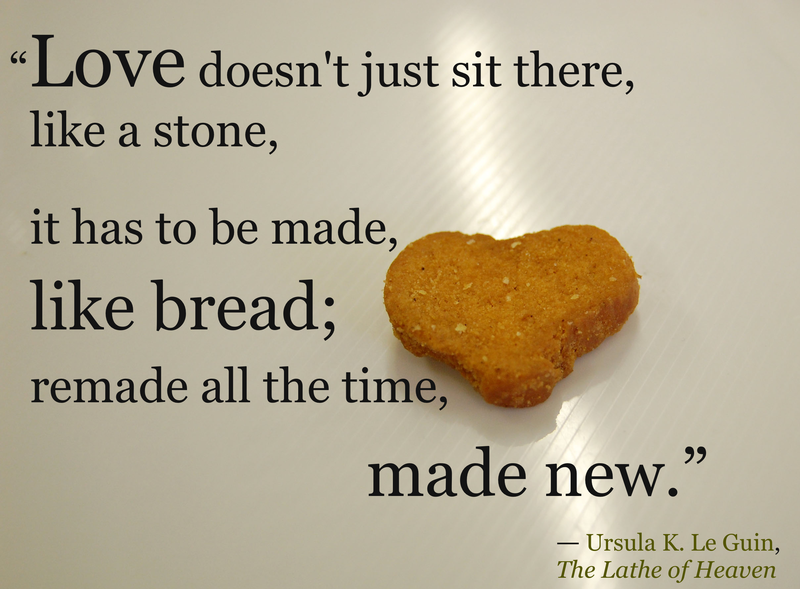 While writing the life post for this week I came across this quote from Ursula K. Le Guin, and it stayed in my head. I wasn’t sure why – I just knew that it needed some attention. It’s the anathema to the fairy tale; the bane of “Happily Ever After.” It’s actually kind of a corollary of this blog’s mission statement: Making hard times happier. There’s no promise that you’ll be completely happy, that things will stay happy – no, the fact is, hard times happen, and my goal in this blog is to provide some practical tools for making them happier. When it comes to love, this can be an exhausting situation. We spend all that time learning about better ways to communicate, for example, and when the time comes we put them into practice…and suddenly realize that it’s so frakkin’ tiring! We try to embrace more kinds of love into our lives, and forget that along with love comes heartache and fear and risk – until it’s made painfully clear by circumstance – for example, the first time you have to be two places at once because two people you love need you. I’m not talking polyamory here – it could be your boyfriend and your daughter, it could be your two sons, it could be your cat and your grandson. It’s hard work. Especially if you want to do it well, or with any kind of attention and awareness. It’s like bread – you put in a lot of work to make it, to fill your kneads (so to speak), to let it rise, to carefully add heat and watch it take form…and it’s beautiful and tasty and fills the house with beautiful smells. What happens to bread if you leave it at that? If you don’t consume it? It gets cold. Hard. Starts to turn funny colors and grow strange things that you can’t really identify but that seem pretty distasteful. Frankly, when it’s not eaten or given attention, bread turns pretty bad. Only one thing to do, then. Make some more. And there are all kinds of guides to doing that. They urge you on and on to remake your bread, over and over. Movies, books, stories, everything says: you need love in your life. And I agree, it’s true. But it’s also a trap. And here’s the big reveal: this is another blog post about coercion. You didn’t try hard enough. Then again, it works the other way, as well. “Why do you even bother?” may be asked by friends and loved ones, tired of hearing about troubled times. Websites and apps are heavily advertised to find that “new” special someone, whose grass is so much greener. We certainly live in a culture where most love stories involve leaving one love for another “better” one; very few love stories are about lovers who stick together (The Quiet Man, though, is a classic exception to the rule). The unpleasant truth is that there is no right answer. I have certainly had relationships that have lasted long past when I should have left them. I have also had relationships where I stayed the course and was richly rewarded in spite of the troubles. You know what was the definitive thing that told me whether or not it was right to keep “remaking love”? Neither do I. But that doesn’t matter, because the answer is simply this: it’s up to you. You’re the only one who gets to decide what “hard enough” is. Only you. There is no definitive scale of effort, there is no magic book of fate that will tell you what might have happened if you’d left. You are your own choose your own adventure book, and you are the protagonist. That means you get to be the one who decides whether it’s time for a new chapter, for a sequel, or to switch to an entirely new genre. No one else. Not your friends, your parents, your kids, certainly not the partners who are coercing you either way. “Why do you stay?” should be met with a simple “Because I choose to.” Likewise, “Why can’t you stay?” can be met with a simple “Because I choose not to.” That’s it. They have their own story to write; you may be a major character in their life but you are not the protagonist. Write your own story. Try as hard as you need to, and no more – the only person you owe is yourself.